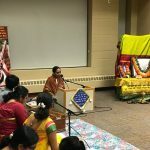 Seattle GOD Chapter organized a Sampradaya Camp during Spring Break in April 2012. 45 children of varying ages benefited by immersing themselves in Indian Heritage, Divinity and Culture. The camp started off every morning with Nama Sankeerthan reverberating with the sound of cymbals, kartals and sweet voices singing in melody. 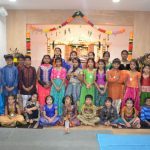 This was followed by Shloka: Madhurashtakam describing the sweetness of the sweet Lord, Krishna, led by Mrs. Aparna Srivatsan and Mrs. Sandhya Anand. Dr. Virender Sodhi and his team of Ayurvedic Physicians enlightened the children with Traditional Treasure: Ayurveda that we could imbibe in our day to day lives. The children had a hands-on workshop making Churnams for digestion and they had a blast pounding away with a mortar and pestle. 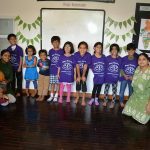 Mrs. Vaishnavi Muthukaruppan worked with the Ayurveda Team to ensure that the kids got the best out of this session. It has been Sampradaya’s tradition to do a musical theater presentation on the final day for parents and special invitees. The thematic presentation chosen for this camp was: Villu Pattu on Krishna’s Kalinga Nardhana. Starting off with the traditional invocation ‘Thandhanathom endru solliye’, the children saw how Krishna’s mischief and leelas metamorphosed into various forms through songs such as Vishamakara Kannan, Maadu Meikkum Kanne, Theeradha Vilayattu Pillai and culminating in a Kalinga Nardhana Thillana. Our team of talented musicians, Mrs. Bhavani Ram, Mrs. Aparna Srivatsan, Mrs. Sandhya Anand and our teen volunteer, Ms. Meera Kumanan led the Villu Paatu session on the singing front. Chaya-Chitra, a unique Photography session was conducted by Mr. Vijay Sureshkumar, who has directed several movies and children’s short films. Mr. Muthu Annamalai, Mr. Krishnan Duraiswamy, Mr. Anand Kumar ably assisted Vijay ji in this session. Madhubani Art was a children’s favorite and was guided by a reputed Seattle artist, Mrs. Stuti Garg. What’s a Sampradaya Camp without Culinary Art. The children learnt to make spicy, crisp Anjaneya Vadas, guided by Mrs. Lalitha Narayanaswamy and Mrs. Ramya Shankar. A small ceremony ensued where the chief priest of the Vedic Cultural Center temple adorned Hanumanji with the ‘Vada Mala’ made by the Sampradayans. Young Khiladi featuring traditional Indian games such as Pallanguzhi, Kho-Kho, Paramapadam and other games were a hit amidst children and our volunteers alike! 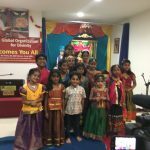 After a successful performance of Villu Paatu by the children, a Heritage Quiz was conducted where history repeated itself again – Sampradayans beat their parents and audience this time too! One testimonial from a child who said “I don’t want to go back to school next week; can I just go back to Sampradaya Camp for one more week instead” speaks volumes about the camp. The kids participated happily in all the actvities and expressed their eagerness to participate in the upcoming Sampradaya camps.